HOLD YOUR MAN (1933) --- Someone turned off the pleasure switch halfway into this one. Up to then a ribald precode with promise to rank among the classification's best, Hold Your Man plunges down the coal chute to an end welcome as any I ever longed for. What missed opportunity was this second co-star teaming of Clark Gable and Jean Harlow after sensation of Red Dust. You could cry for how MGM blew it. Word is that Thalberg went on extended vacation and left Hold Your Man to Louis Mayer's tender mercy. Something blew a fuse, and here we are still suffering, most recently via Warner Archive spiffed-up release on DVD (quality never better). Do I recommend? Absolutely --- for star power and that dynamic first act good as anything before censor crackdown. Gable calls Harlow "sweet meat" and they cohabit openly. She slugs a woman in the jaw with a closed fist (impressive!). He instructs on finer art of lifting a sucker's "poke." She makes gin (doesn't everyone?) in a shabby flat. They play "bill poker" (a scam) on sweet-natured Stuart Erwin, too trusting to survive in precode's squalor. Anita Loos wrote this stuff and must have had fun doing so until third act screws got tightened. Hold Your Man under other circumstances might have been the definitive romance of thieves, an underclass variation on Trouble In Paradise. Surely it would have been so at Warners, or maybe Paramount, but this was mid-1933 and MGM was rinsing laundry in anticipation of a new order. There's a Hold Your Man theme song with Harlow talking the lyrics in lieu of a tune she couldn't carry (it works), and again as with vintage pics, we assume (as did then-patrons) that most anyone could play piano reasonably well (and in days before radio and dreaded TV, many of them could). Let a movie character today do keyboard and you'd have to explain how they came by such remarkable skill, but back then? ... common as Coke bottles (wish I'd learned, and failure sure wasn't for lack of parental effort). I like Harlow still, but she becomes more unearthly as further years elapse. Was it the eyebrows (or lack of them)? Close-ups of those thin pencil lines give me the shakes. Was she obliged early to shave them off in obedience to then-fashion? 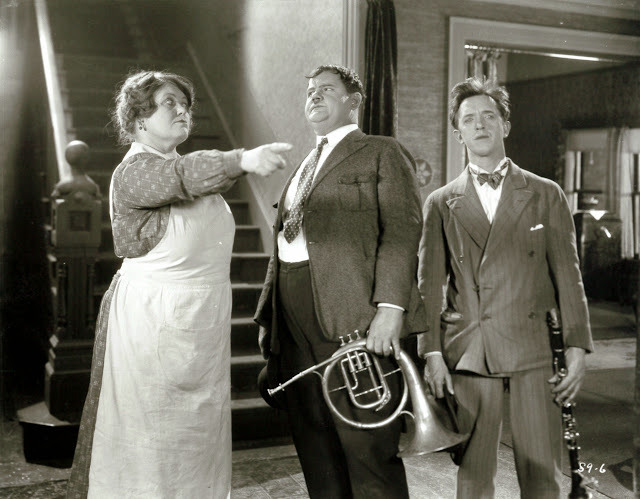 YOU'RE DARN TOOTIN' (1928) --- A Laurel and Hardy that was ideally suited to breakdown for Robert Youngson compilations, being three distinct segments of bite-size duration. Tootin' came of that opener season for Hal Roach comedies distributed by powerhouse MGM, thus preferred playdates and a wider than ever audience for newly-minted Stan and Babe as starring team. Production too was glossed in accord with upgrade handling. I noted a gag done frequent before, but freshened here --- the boys walk frontwards toward a tracking camera, Stan suddenly disappears below the frame, the camera proceeding on to reveal he's fallen into an open manhole. A minor advance, but it showed real care applied to L&H as their act caught fire toward becoming Roach's top ticket lure. 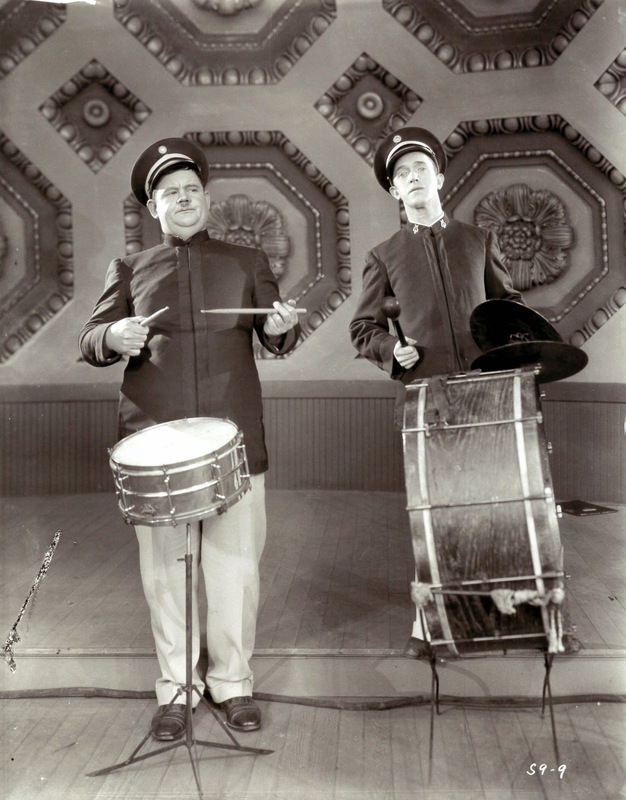 The bandstand lead-in, Stan/Babe as inept musicians, was fortuity for Youngson as it all but cries for synchronized sound accompaniment, which decades later was applied as opener for 1967's The Further Perils Of Laurel and Hardy, one of the best-ever aural enhancements RY put to silent footage. Shin-kicking and pants-ripping in a second of Tootin's two reels had been useful ten years before Perils when Youngson used the melee to highlight his first compilation, The Golden Age Of Comedy. That donnybrook took place on Roach's backlot "New York Street" as opposed to Culver City openness we'd call home in much L&H before and aft. Maybe so much carnage needed containment and control of on-lot filming, as even jaded Culver pedestrians might have been alarmed by extras numbering dozens tearing off each other's garments. Now regarded a summit of everything L&H did best in formative years, You're Darn Tootin' prints exist in varying degrees of gorgeous, my choice being Region 2's rendition among 21 discs in a UK set. 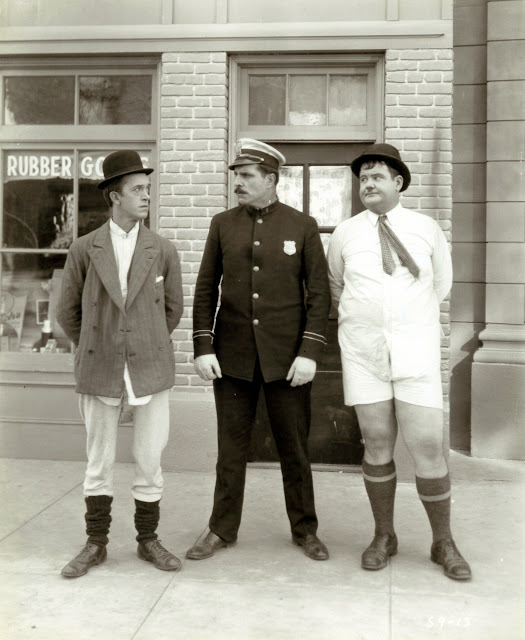 Just those stills show the difference between Laurel & Hardy's silent and sound shorts. Pre-Depression, the boys tend to be fairly well-dressed and living in pretty comfortable houses. By 1929, their clothes and living quarters start to become much more shabby, as if reflecting the reality that much of the country was suffering from. Often, they're homeless, living in parks, fishing docks just to eat. 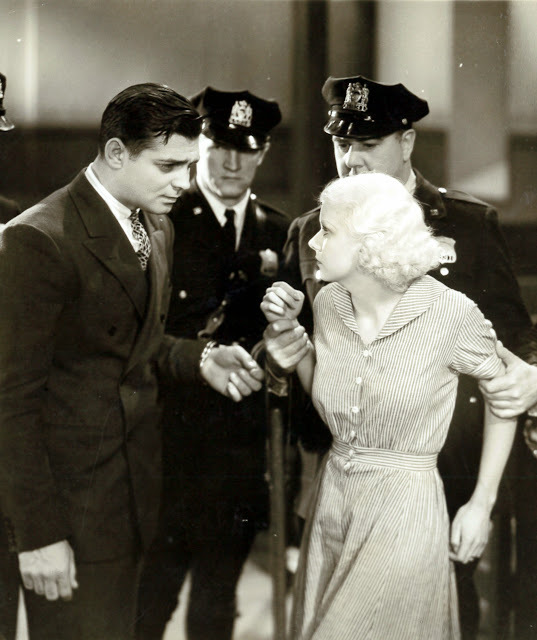 For all their brilliant humor, there's an undercurrent of sadness in many of their early talkies that's become apparent to me only as I get older. Very good observation, Kevin. Laurel and Hardy did occupy a sunnier world before sound and a Depression got hold. One thing that keeps their comedies fresh for me are such transitions as you mention. L&H was never a monotonous series, and that "undercurrent of sadness" enriches their films, at least for me. This happened moments ago: A guy doing yard work saw a Laurel and Hardy display I have in the carport (yes, that's how far gone I am) and said he watches the boys every Sunday morning on MeTV and really likes them. A refreshing surprise, then, to hear from someone not among movie buff ranks who still looks at L&H on television. Oddly enough, I've been spending time lately with several teenagers. Don't jump to any conclussion...there's a legitimate reason. Both are college drama majors. I asked them separately last Saturday if they knew who Laurel & Hardy were, and they each said no. Then this morning, I asked a 28-year-old male the same question, and he answered, "I think I've heard the names, but I don't know who they are." Laurel and Hardy HAVE shown up pretty often on TCM, and there are bound to be at least a few younger viewers noticing them there. Are they otherwise forgotten? A boxing scene featuring Laurel in BATTLE OF THE CENTURY has none other than Lou Costello as an extra in the audience! Many comics, along with cartoon characters, bounced freely between middle-class comfort and the underclass -- before WWII, at least. "Below Zero" and "Mickey's Good Deed" both present starving, freezing street musicians without the surrealism or stagebound whimsy that, say, Red Skelton would bring to similar material. Look at Three Stooges comedies where the trio is living in a dump or a vacant lot, jury-rigging some mock domesticity and fleeing the cops -- hardly gritty reality, but recognizing not everybody lived in Andy Hardy's neighborhood. Rags to riches stories often involved real rags. Lighter-than-air musicals would have heroes and heroines dependent on a miracle for their next meal. My rough impression is that comic poverty went largely out of style after the war -- maybe even during the war -- with comedy shorts evolving into the suburban TV sitcom and the occasional vagabond being much more a quasi-Chaplin fantasy than anything remotely real (think lovable hoboes with smashed top hats, presented as symbols of freedom and sloth). The Pink Panther was sometimes a hungry vagabond, but he was just as likely to join Mickey, Popeye and even Daffy Duck as a homeowner. While early L&H sometimes placed the boys in frankly dire straits, poverty was toned down for them in the final Fox features. They usually had jobs or stumbled into them; low on the social scale because comedy favors underdogs but never quite destitute. Occasionally they verged on lovable hoboes: One film began with them being thrown out of various towns, Hardy's response being indignation rather than any fear or desperation. The one glaring exception is MGM's "Nothing But Trouble." Most of the film is weak nonsense about a prince, but there's one scene of the boys in a real-looking flophouse, two discouraged old men perilously close to the streets. You could sort of take them as incompetent panhandlers in "One Good Turn," but this was clearly no place for Stan and Ollie -- especially with the characters themselves comprehending it. I not only agree inside-out with you about Harlow's eyebrows, but I want to tell you I've felt for most of my adult life that they RUINED her with that [Wo]man from Mars look. You're the man, where photo archives are concerned. You could've clinched your case, I think, by fishing out a photo of her from the set of that L & H film she briefly appeared in, the one where they were responsible for ripping the back of her dress off, as best I can reconstruct the 'bit'. She is gorgeous in this, and it's not only her celebrated figure, it's her pre-vandalized makeup, where they left her nice, shapely eyebrows (you can relax now) alone. They were full and furry and beautiful. 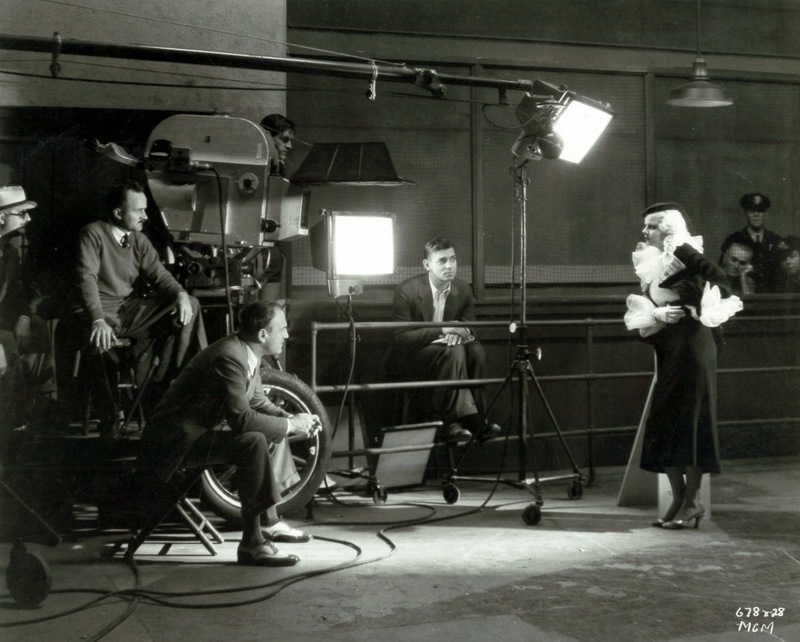 Whatever evil genius got ahold of her at MGM later on ought to be identified and scourged for what he did to her. Of course, they did the same thing to Dietrich over at Paramount. I am not a makeup-ologist so I can't supply the smoking gun on this one, and what's more I've always loathed the role fashion plays in makeup; unlike many of my colleagues, for whom that's the whole attraction. (Of course, they usually have to call the union for backup when the script requires that someone have a scratch on their face, or a mustache stuck on.) I bow to the memory of the great Audrey Hepburn, who it's said demurred in spite of it being her great breakthrough opportunity when the Paramount handlers wanted to pare down her emphatic natural brows for "Roman Holiday". If she's the one who put her foot down, she was vindicated. She starred in movies from that point forward, and always with those expressive brows part of the delectable package. And when the stupendous Sophia Loren was imported from Italy, she also had strong brows to frame those gorgeous sloe eyes. Ava Gardner, several others come to mind, who never suffered ruination of their eyebrows. I think even Dietrich gradually morphed with the times; but of course Harlow was denied that option in her tragic early demise. So much more the impulse for displaying a photo of the way she looked in that L & H short! Speaking of whom...I enjoyed your other profile of the L & H movie "You're Darn Tootin'". I feel I may have seen a copy of this on 35 nitrate that was screened years ago in a program of L & H rarities at a theater in Santa Monica. If it is the same one, the print I saw varied from skin-prickling "you are there" perfection to some of the most horrific damage from age or I-don't-know-what I've ever seen in an older film. All over the place. Too bad, because (again, if I have the right one!) it was hilarious stuff, the boys at their best. I've heard tell that the Roach properties have been freed up again so that it's possible for the negatives, master positives, any and all materials that may have miraculously survived the decades to be evaluated and rescued if possible, and one would pray maybe restored versions of the L & H movies reissued in HD, one day. In fact, I'd heard that the preservation and restoration wing at UCLA was engaged in just such an effort. Have you heard anything about this 'on the drums', John? In answer to that last, Craig ... I understand UCLA is doing a large-scale restoration of all the L&H comedies as we speak. Recently, I had to take definite issue with a Psychiatrist who has written a book about Charlie Chapin’s early life. He was appearing on an NPR talk show plugging his book and on the show he postulated that all great art was produced by people with horrible or impoverished childhoods. A caller tried to argue the point with him, mentioning that Stan Laurel had come from reasonable middle-class circumstances, had pretty much the same theatrical background as Chaplin, and had created great comedy. The shrink then declared that Stan Laurel had never created anything near the level of Chaplin’s work. Indeed, the shrink may be right, for the older one gets, the more this author finds much of Chaplin’s work, especially when he’s reaching for those audience tears by falling into self-centered Victorian maudlin melodrama, rather shallow and false, and the more this author sees Laurel and Hardy’s work, where they frequently dealt with some truly human, dark, and very interesting themes in a very deceptively lighthearted but very honest fashion, the greater depth of soul I find in their comedy. Yep, Laurel and Hardy may indeed be nowhere near Chaplin’s level of art, they may be far beyond it. I think there is some incredible truths and insight spoken of the Human Condition in the Boy’s films, the way a small disagreement between people can be myopically yet magnificently magnified into major destruction in BIG BUSINESS, the ever-present struggle between men and women, especially when married to each other, that they examined numerous times in films like SONS OF THE DESERT, COME CLEAN, BLOTTO, and many others. They could even go into Chaplin territory and the struggle for survival in adverse times in films like ONE GOOD TURN, still presenting a face of common decency against hardship, a lesson well needed to be learned these days. Or this strange, sad little film. Is there a bleaker image in film comedy than the sight of Stan and Ollie, destitute and desperate musicians standing out in the cold of a very cold winter, plonking through “In the Good Old Summertime” to nobody in particular? 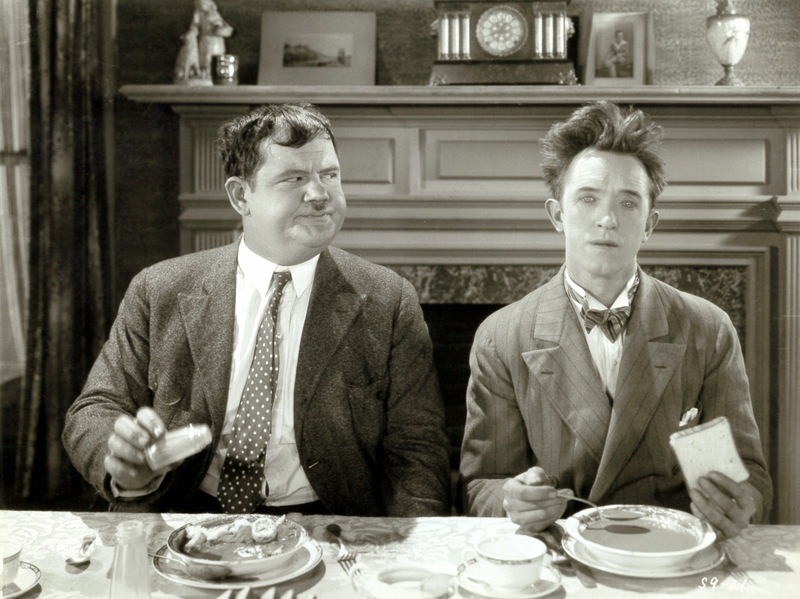 BELOW ZERO was a reworking of a Clyde Cook Roach comedy called STARVATION BLUES (1925) which Stan Laurel had co-written, and it defines near perfectly Laurel and Hardy’s relationship between themselves and their not-so-nice universe. No matter when betrayed by life, so-called friends, spouses, or what-not, they still have each other, and that may be a message far more important than Chaplin, the perennial emotional outsider ever thought of and didn’t even get close to concluding until the end of MODERN TIMES in 1936, you can’t really go it alone, no matter how much credit you give yourself. Middle-class upbringing or no, Stan Laurel created great comedy AND great art, in that order of importance. Then again, he didn’t do it until Hardy came along and contributed, and Babe’s childhood was no picnic. Hey, the shrink may have hit it on the head, could Oliver Hardy really be the heart and soul of their humor? Certainly in performance, listen to the real concern and panic in his voice at the end of this film when he can’t find Stan. That is quality acting that doesn’t get enough attention from those praising L and H’s work. Hardy is indeed the warm one of the pair who really connects with the audience, giving the gags Laurel created the framework that gives it the extra dimension. Compare it to what Laurel was doing before he met Hardy and you know what I’m talking about. Now don’t get me wrong, I love Chaplin’s work here too, I’m really going after the book-writing shrink who fancies himself a critic, but it’s time to recognize that Laurel and Hardy’s comedy also has great depth hidden in the fact that they didn’t plead for tears from their audiences. The tragically hip and cluelessly pretentious always fall for the easy tropes, and Chaplin is out front there saying “look at me! laugh at me! cry for me!” nicely bookmarked so they know how to think. Harder to identify when the edge is more subtly hidden in the humor, as somebody once said, “tragedy is easy, tell `em their dog died, now make it funny!”. I don't think it's necessary to denigrate Charlie Chaplin to praise Laurel and Hardy. I love them both but Chaplin really was in a class by himself to me.